The Donaukanal Canal is a side-branch of the Danube that runs through a very central area of Vienna. It is often called "Kleine Donau" (Little Danube) and branches off the main stream in Nussdorf between the 19th district of Döbling and the 20th of Brigittenau. It makes the 20th and the 2nd district an island, before it recombines with the Danube at the so-called Praterspitz just before the Alberner Hafen port in Simmering. After the Ringstraße and the Gürtel, the Donaukanal Canal is probably Vienna′s third most important life-line. The water surface of the Donaukanal Canal belongs to the districts of Brigittenau and Leopoldstadt. It is an important ecosystem and a welcome refugee for many species of fish that are endangered in the main branch of the Danube. According to a recent study, there are 30 species of fish native to the Donaukanal Canal and certain areas are very important breeding grounds. 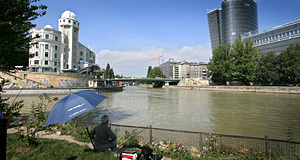 The area where the Wien river runs into the Donaukanal, for example - a sport very popular with urban fishermen. Walking down the Donaukanal Canal, you will find many interesting buildings and sights: Various bars, boats and lido-like facilities that the city of Vienna has created in a desperate attempt to make the area more attractive; unfortunately, due to heavy traffic and the general shabbiness of the neighbourhood, this has mostly failed so far. The Donaukanal is often compared to the Seine shore in Paris - which is utterly ridiculous. Nevertheless, there are a few sights by the Donaukanal worth noticing, such as the destructor of Spittelau, the Rossauer Kaserne army base, the Ringturm tower, the Ruprechtskirche Church or the Urania. As a recreational area, some greener part of the Donaukanal are usable, however, there are heavy-traffic roads almost everywhere along the canal. Constantly, there are proposals being made by various societies and parties on how to make the canal more attractive - boat hotels, lidos, pools, bars, promenades - but so far, these plans did not show a satisfactory result. Now some history of the Donaukanal Canal: During the Middle Ages, the line of today′s canal was the main river bed of the Danube. The city of Vienna developed in an area that was fairly safe of floods, which were frequent and led to occasional changes of the river bed. From around 1700, the term "Donaukanal" became popular, referring to a side-branch of the Danube. The main river bed had moved eastwards. In 1870, when Vienna underwent its most dramatic modernisation move, the Donau river bed was regulated and evened out with stone and concrete plates. A leap into the 20th century was made at the Donaukanal, when the first "Stadtbahn", sort of a fast inner-city train was opened along the canal. It was designed by Otto Wagner and continues to run today - as the subway line U4. Later it was extended to Hietzing and Schönbrunn, as well as along the Gürtel Road until 1906 (today′s U4 and U6 subway lines). Otto Wagner also designed the dark-blue and white Schützenhaus on the left side of the canal, a storage house of a lock in the canal. Today, it is not used for this original purpose and in rather sad shape. Continue with "Donaukanal Canal - Part II"